For our August Bath issue, we asked local kitchen and bath professionals if freestanding tubs are a classic or a craze. "I think the freestanding tub is a classic. From the early days of clawfoot tubs to the modern sleek versions today , no matter what design you choose it always becomes the focal point. They now have several types of freestanding tubs that offer different systems including jets and heated backrest. They also come in larger sizes, so they are more comfortable than their predecessors. " Linda Thomas , Signature Kitchen & Bath. “No doubt, the freestanding tub is an enduring classic with no boundaries. Unencumbered by walls, they serve comfortably in the center of the room or snuggle to full-length windows as if floating in the trees and view. Contemporary or traditional, any style is at home with the freestanding tub. A freestanding tub allows easy adjustment of window treatments that other tubs require climbing and stretching for opening or closing.” Jane Ganz, Directions in Design, Inc.
"Freestanding tubs are timeless and classic. Throughout history and the world they have stood the test of time. Styles range from the elegant, traditional clawfoot tub to something very sleek and contemporary. The freestanding tub design opens up space giving an airy feel and look to your bathroom, thus creating a spa‑like environment for soaking and relaxation. A variety of tub materials, such as acrylic, cast iron, copper, stainless steel and stone offer design opportunities to please any style." Ashleigh Schroeder, National Kitchen & Bath. "Classic. A clawfoot tub is classic and has been around for years, yet the design and function has been improved tremendously. Plumbing manufacturers continue to appease the consumer with newer lines, curves and features in freestanding tubs. Some of these newer designs may be more contemporary but can be paired with more traditional cabinetry creating a timeless design. 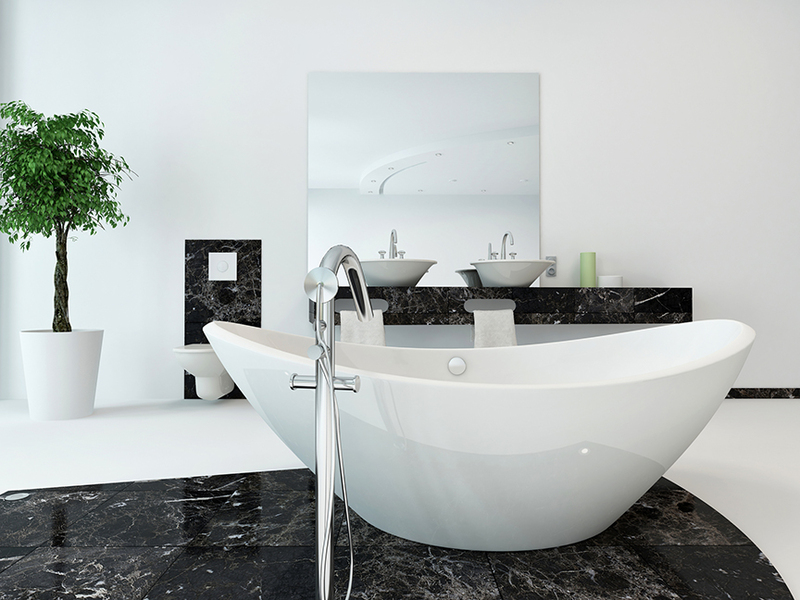 As long as consumers yearn for a relaxing, soothing bath, a freestanding tub will always be an option to consider." Jeanne Liston, Liston Construction Company. “Like most other trends, there are ways to interpret the freestanding tub to make it classic, and there are ways to overdo it and date yourself. Finding that balance is hard. I let the architecture of the home drive the bathroom design and if the tub harmonizes with the interior architecture, it still will feel fresh decades later.” Paige McClellan, The Lawrence Group. “Classic! In the right space, you can create a focal point that is timeless, clean and elegant. Freestanding tubs have been around forever, but over the years have created more overall style choices of the tub by either using ball-and-claw feet, a pedestal or a smooth floor-mounted version. You can even paint the underneath sides to add a pop of color. Try one with an air-bath system to enhance the bathing experience with hydrotherapy." Anne Boedges, Anne Marie Design Studio.